Direct-to-fan marketing is part of a broader direct-to-fan model in which artists operate outside of the traditional music industry framework and focus on communicating with (and selling to) their fans directly. The marketing portion of the direct-to-fan model emphasizes using online platforms to promote new music, tours, etc. Fostering a social networking connection with fans is important in direct-to-fan marketing, as are tools like band newsletters and widgets. 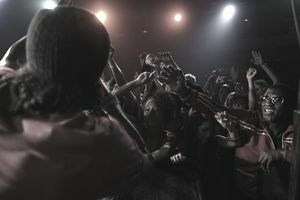 This type of marketing often allows musicians to gather information about their fans they can use to refine their marketing strategies, such as offering a free music download in exchange for a fan's email address, which then can be used to send direct promo materials about a new release or a tour. The explosion of direct to fan marketing is a direct result of the collapse of the music industry's traditional model, the retail marketing of CDs. With the advent of illegal music downloads on the Internet, record companies had to come up with an alternative that, although not particularly good for the industry or musicians, was better than free. That turned out to be the mass marketing of digital downloads on digital platforms—mostly tune by tune rather than by the album. The problem with that model becomes very clear from a 2015 Guardian report that compares what an artist receives in record royalties from a major label selling a CD with what an artist gets from a download. CDs vary in retail price, of course, but the average is around $15. The artist typically gets between 10 and 15 percent of that average or something in the neighborhood of $1.50 to $2.25. A digital album download may net about the same, but the problem is that fans no longer primarily buy albums. They usually buy the single, which on Amazon nets the musician around 23 cents. But the sales trend for music is away from downloads and toward streaming platforms like Spotify and Google Play, where the single download that nets 23 cents on Amazon earns less than 2 cents. In some situations, streaming revenues per tune can be dramatically worse. In 2014, Spotify's CEO admitted that in the previous year they paid artists less than 1 cent per play. Hence, the advent of direct to fan marketing. Marketing her own CDs directly to fans at performances. For many musicians, this results in just a few sales each night; for others, sales of a hundred or more CDs at each performance are not uncommon. Often the best price point is an even $15—this way the fan doesn't have to find change—a ten and a five will do. The good news is that CD pressing costs have gone way down, and all but two to three dollars of that $15 goes to the artist. Selling digital downloads and CDs through media like CDBaby that make the artist responsible for creating the product and in return allowing the artist to retain most of the money. Using social media like Facebook to build the fan base, then marketing both performances and product through emails from the artist to the fan. Ahead of the game in so many ways, Prince had been doing this for years. Offering fans social incentives for buying products and attending performances. These strategies take advantage of the real affinity that exists between an artist and each individual fan. You can accomplish this in various ways. You can incentivize attendance by actually encouraging your fans to record live performances—a strategy that worked very well for the Grateful Dead. You can offer premium packages that include a backstage pass and a "free CD," signed by you, the artist. Underlying these tactics is a general strategy: connect with the fan in as many ways as possible; encourage communication between artist and fan through blogs and emails; then use that communication to give the fan something he already wants: a personal connection with the artist. In many ways, this is a better way of making a living as an artist. The old model treated fans as anonymous buyers of product sold through corporate middlemen. With direct to fan marketing, sales is just one component of a meaningful and more personal connection between the fan and the artist. Do You Need a Degree to Work in the Music Industry? Why an EP Should Be a Part of Your Music Promotional Tool Kit?